Foundation project: This work was financially supported by the Faculty of Veterinary Science, Mahidol University. The sample used in this study were collected by the project of Establishment of zoonotic viral networking system: developmental phase; subproject of Influenza A virus surveys in migratory and residence birds of Thailand granting from Cluster and Program Management Office (P-15-50535), the National Science and Technology Development Agency, Thailand. During 2017-2018, tracheal and cloacal swabs of 313 wild birds from 11 orders and 51 species from seven provinces in Thailand were collected and examined [Table 1]. The samples were kept in VB lysis buffer (Geneaid, Taiwan) and transferred to the laboratory in a cool chain within 48 hours. At the laboratory, genomic DNA was extracted from the samples using the viral nucleic acid extraction kit Π (Geneaid, Taiwan). The animal handling protocol used during sample collection and the samples used in this study were approved by the Animal Care and Use Committee of the Faculty of Veterinary Science, Mahidol University (Protocol No. MUVS-2017-02-04 and MUVS 2018-01-02). Table 1: Details and number of wild birds tested in the study. For all bird samples, the housekeeping gene (12S rDNA) was detected to examine the quality of the DNA. All samples were found to be positive for the 12S rDNA gene, indicating the good quality of the DNA. For Chlamydiaceae detection, of 313 wild birds, two (0.64%) were positive for Chlamydiaceae with asymptomatic infection. These birds were Asian openbill storks (Anastomus oscitans), which belong to the order Ciconiiformes. The positive rate for Asian openbill storks was 4.9% (2/41). The ompA gene of the positive samples was amplified and sequenced. Nucleotide sequencing of the ompA gene (Accession No. MK007613 and MK007614) in our study showed only 94.1% genetic similarity to Chlamydia spp. of Eurasian magpies (Pica pica) and mute swans (Cygnus olor) in Poland (Accession No. KX870484.1, KX424658.1, KX062052.1, KX062055.1). 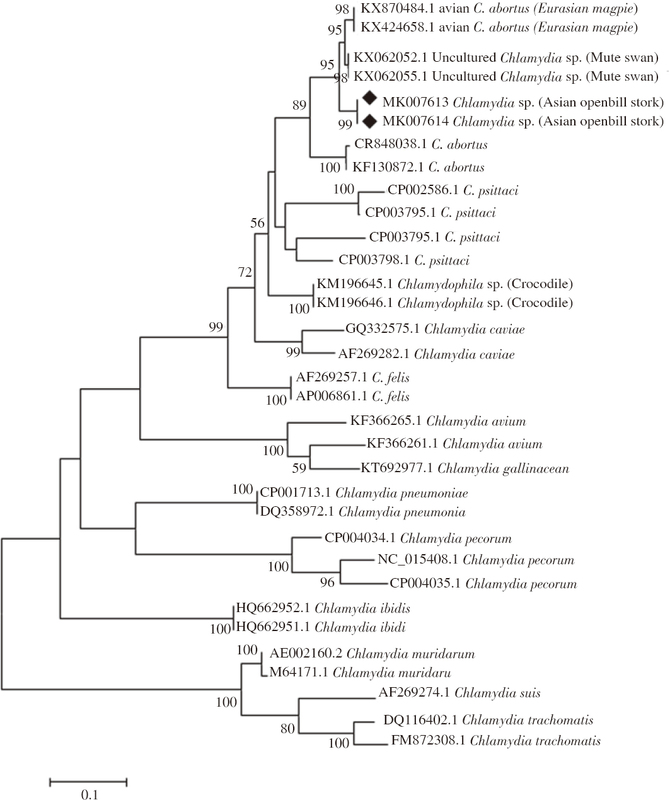 The ompA phylogenetic tree analysis showed that the Chlamydia spp. detected in Asian openbill storks can be grouped together with 99% bootstrap support and was closely related to Chlamydia spp. detected in Eurasian magpies and mute swans in Poland but had a different cluster creation with a 95% bootstrap value [Figure 1]. Additionally, the Chlamydia spp. found in this study had a closer relationship to C. abortus than any other known Chlamydia. Figure 1: Phylogenetic tree resulting from analysis of deduced amino acid sequences of the Chlamydiaceae ompA gene. The percentage of trees in which the associated taxa are clustered together is shown next to the branches. The tree is drawn to scale, with branch lengths measured in the number of substitutions per site. The sequences analyzed in this study are indicated by a black rhombus. Stephens RS, Myers G, Eppinger M, Bavoil PM. Divergence without difference: Phylogenetics and taxonomy of Chlamydia resolved. FEMS Immunol Med Microbiol 2009; 55 (2): 115-119. Everett KD. Chlamydia and Chlamydiales: More than meets the eye. Vet Microbiol 2000; 75 (2): 109-126. Vorimore F, Hsia RC, Huot-Creasy H, Bastian S, Deruyter L, Passet A, et al. Isolation of a new Chlamydia species from the feral sacred ibis (Threskiornis aethiopicus): Chlamydia ibidis. PLoS One 2013; 8 (9): e74823. Sachse K, Laroucau K, Riege K, Wehner S, Dilcher M, Creasy HH, et al. Evidence for the existence of two new members of the family Chlamydiaceae and proposal of Chlamydia avium sp. nov. and Chlamydia gallinacea sp. nov. Syst Appl Microbiol 2014; 37 (2): 79-88. Taylor-Brown A, Bachmann NL, Borel N, Polkinghorne A. Culture- independent genomic characterisation of Candidatus Chlamydia sanzinia, a novel uncultivated bacterium infecting snakes. BMC Genomics 2016; 17: 710. Taylor-Brown A, Spang L, Borel N, Polkinghorne A. Culture-independent metagenomics supports discovery of uncultivable bacteria within the genus Chlamydia. Sci Rep 2017; 7 (1): 10661. Essig A, Longbottom D. Chlamydia abortus: New aspects of infectious abortion in sheep and potential risk for pregnant women. Curr Clin Microbiol Rep 2015; 2 (1): 22-34. Reed KD, Meece JK, Henkel JS, Shukla SK. Birds, migration and emerging zoonoses: West Nile virus, lyme disease, influenza A and enteropathogens. Clin Med Res 2003; 1 (1): 5-12. Krawiec M, Piasecki T, Wieliczko A. Prevalence of Chlamydia psittaci and other Chlamydia species in wild birds in Poland. Vector Borne Zoonotic Dis 2015; 15 (11): 652-655. Szymanska-Czerwinska M, Mitura A, Niemczuk K, Zareba K, Jodelko A, Pluta A, et al. Dissemination and genetic diversity of chlamydial agents in Polish wildfowl: Isolation and molecular characterisation of avian Chlamydia abortus strains. PLoS One 2017; 12 (3): e0174599. Konicek C, Vodrazka P, Bartak P, Knotek Z, Hess C, Racka K, et al. Detection of zoonotic pathogens in wild birds in the cross-border region Austria-Czech Republic. J Wildl Dis 2016; 52 (4): 850-861. Jeong J, An I, Oem JK, Wang SJ, Kim Y, Shin JH, et al. Molecular prevalence and genotyping of Chlamydia spp. in wild birds from South Korea. J Vet Med Sci 2017; 79 (7): 1204-1209. Sariya L, Prompiram P, Tangsudjai S, Poltep K, Chamsai T, Mongkolphan C, et al. Detection and characterization of Chlamydophila psittaci in asymptomatic feral pigeons (Columba livia domestica) in central Thailand. Asian Pac J Trop Med 2015; 8 (2): 94-97. Suksai P, Lorsunyaluck B, Dittawong P, Sanyathitiseree P, Lertwatcharasarakul P. Genetic detection and identification of Chlamydophila psittaci in captive psittacine birds in Thailand. Thai J Vet Med 2016; 46 (1): 67-75. Miyaki C, Matioli S, Burke T, Wajntal A. Parrot evolution and paleogeographical events: Mitochondrial DNA evidence. Mol Biol Evol 1998; 15 (5): 544-551. Condon K, Oakey J. Detection of Chlamydiaceae DNA in veterinary specimens using a family-specific PCR. 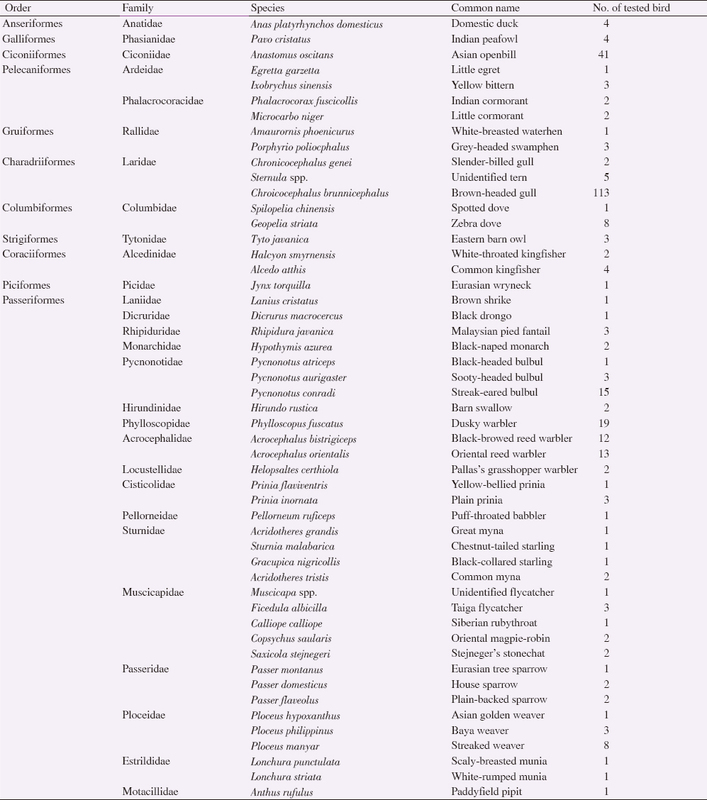 Lett Appl Microbiol 2007; 45 (2): 121-127. Denamur E, Sayada C, Souriau A, Orfila J, Rodolakis A, Elion J. Restriction pattern of the major outer-membrane protein gene provides evidence for a homogeneous invasive group among ruminant isolates of Chlamydia psittaci. J Gen Microbiol 1991; 137 (11): 2525-2530. Kimura M. A simple method for estimating evolutionary rates of base substitutions through comparative studies of nucleotide sequences. J Mol Evol 1980; 16 (2): 111-120. Kumar S, Stecher G, Tamura K. MEGA7: Molecular evolutionary genetics analysis version 7.0 for bigger datasets. Mol Biol Evol 2016; 33 (7): 1870-1874. Kaleta EF, Taday EM. Avian host range of Chlamydophila spp. based on isolation, antigen detection and serology. Avian Pathol 2003; 32 (5): 435-461. Szymanska-Czerwinska M, Niemczuk K. Avian chlamydiosis zoonotic disease. Vector Borne Zoonotic Dis 2016; 16 (1): 1-3.